Gravlee knew from an early age that he wanted to go into medicine. "Medicine and surgery are the only professions I've ever really been exposed to," remembers Gravlee. "One of my earliest memories - it must have been around age four - is of jumping off a stool and hiding under my dad's surgical table in the veterinary clinic after experiencing an unexpected arterial bleeder in my face! The only way I ever got to see my father was if I followed him into the clinic and barnyards and later in his career into the research facilities and clinical laboratories. Many of the sights, smells and hands-on experiences - like pulling calves - are indelible upon my memory." He comes from a long line of creative thinkers. An uncle, the late Clark Gravlee, M.D., a former OB/GYN in Birmingham, held patents on several instruments, and his father, Dr. Frank Gravlee, a retired veterinarian and patent holder, has created and produces a special nutritional formulation, Farriers Formula, that is saving the lives of horses around the world by stimulating the growth of sound, healthy hooves. "My uncle, Clark Gravlee, was really a mentor to me, and I always thought I would become an OB/GYN like him. But a big obstacle stood in my way," explains Gravlee with a big laugh. "I really need my sleep and I just didn't think I could function properly with catnaps between labor contractions! 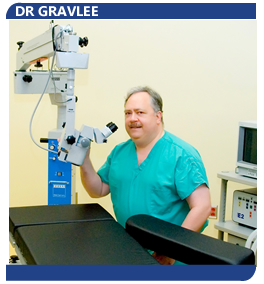 Gravlee choose ophthalmology, and after undergraduate training at Washington & Lee and the University of Alabama, Gravlee graduated from Tufts University School of Medicine in Boston. He did an internship at Baptist Medical Center in Birmingham and his residency at the University of Alabama in Birmingham. In 1985, Gravlee and his wife, high school sweetheart Glenda Ritchie of Birmingham, settled in Fairhope and he opened his practice under the name of Bay Eyes. Today he has an additional office in Foley and is soon to be opening his own surgery center in Fairhope. In 1986, the Gravlee's bought a former hotel on Mobile Bay in Fairhope and named it "Away at the Bay." Now a bed-and-breakfast, the structure has been turned into a spacious residence for the Gravlee family which now includes two sons and a daughter. Additionally, there are six charming suites in the popular bed-and-breakfast. Occasionally, out-of-town patients will stay at the inn, allowing Gravlee to make evening rounds from the comfort of his home. Dr. Gravlee refers to his wife as "a real partner." She manages the bed-and-breakfast and also handles the accounts payable for his practice, which currently includes two optometrists. When not at work, Gravlee enjoys sailing, bird hunting, chess and exploring the Internet. He's been a member of the Fairhope Rotary Club for many years, having served a term as president of the club. He was presented Rotary's highest honor, the Paul Harris Fellow Award. He is active in the St. James Episcopal Church in Fairhope. "It makes me humble and thankful," says Gravlee, "to know that I have been blessed with a wonderful wife, family, community and the ability to serve God, who is the great physician."